After decades of methodical expansion, Frederick Wiseman’s oeuvre has finally intersected with The Simpsons. The meeting feels somewhat inevitable: like the show Matt Groening created, Wiseman’s filmography is one of the great encyclopedic compendiums of American life, a close reading of the country’s institutions that has made the director something of an institution unto himself. The moment of intersection comes toward the middle of Monrovia, Indiana, as a school band does its very best to make it through the animated sitcom’s Danny Elfman–scored theme song. Wiseman cuts amongst disparate faces in the audience, many of which go hopelessly blank as their attention migrates to who knows where (one of the lessons Wiseman’s camera teaches us is how often we lose track of our physical selves amidst the manifold rituals of civic life, which is to say: judge not their yawns lest ye be judged). Still, it’s a genuinely funny moment, one of many that show the director possessed of a distinct comic sensibility, even if it remains unlikely that he’ll ever be called on to do a couch gag. The long-running Fox cartoon came to mind as I wondered to what degree Wiseman’s Monrovia can be taken as an archetype of the contemporary American town, a sort of Springfield, if you will. Coming at a time dominated by talk of the bifurcation of the country, Monrovia, Indiana is an excavation of life in the other America. Its place within Wiseman’s career also works into this dichotomy: the director’s most recent U.S.-set films, At Berkeley (2013), In Jackson Heights (2015), and Ex Libris: The New York Public Library (2017) all depicted forthright bastions of coastal liberalism. The contrast is striking, not least in terms of demography. To put this in context, the total population of Monrovia stands at 1,441, comfortably fewer than half the number of people who visit Mid-Manhattan Library on a given day. While the previous films focused on proudly multiethnic communities (with Jackson Heights laying claim to the title of the most diverse locale in the country), Monrovia is so thoroughly white and Christian that the number of black faces in the film can be counted on one hand. At Berkeley, In Jackson Heights, and Ex Libris all contain scenes in which speakers pontificate at length about the uniqueness of their communities. The closest analogue to these moments in Monrovia, Indiana comes as a teacher tells his students about their high school’s past glories as a regional basketball powerhouse, led to prominence in the 1920s by local hero and Basketball Hall of Fame inductee Branch McCracken. Wiseman’s characteristically excellent interstitial shots (a skill he’s sharpened to an Ozu-like level of precision) take on a painterly quality, evoking the pastoral mode in its distinctly middle American incarnation. Wiseman is keen to document the material realities of rural life writ large: animals figure prominently in the movie, and an unhurried scene shows how all those bales of hay are made. But on a more basic level, it’s not necessarily some universalizing instinct on the director’s part that makes Monrovia feel like a stand-in for a much broader geographic area. A brief sequence in a supermarket feels uncannily as if it could been filmed more or less in any part of the country. Likewise, a slick new house of worship recalls Cedric the Entertainer’s upstate New York megachurch in First Reformed. The sense of creeping homogenization, of course, doesn’t make the town any less worthy of close attention. Wiseman’s films are always marked by a nuanced interplay between the specific and broader questions, between the images placed before us here and now and the resonances that emerge from their arrangement. True to form, Wiseman maintains a studious aversion to stereotypes here. While the director is in all likelihood aware of all those news outlets sending their reporters into the heartland to brief us on just what the hell those people are thinking, Wiseman is evidently set against making a contribution of his own to the genre. As has been much remarked upon, Trump himself is not mentioned in Monrovia, Indiana. More remarkably, it would be difficult to argue that he’s manifested even as a structuring absence. As far as recent national traumas go, the financial crisis of 2008 looms more heavily than the 2016 election. More so than any overtly deplorable Trumpian rhetoric, one is reminded of Barack Obama’s line about Midwesterners clinging to guns and religion, both of which figure prominently in the film. It is the planning committee that becomes the fulcrum for the film’s political conflicts. Wiseman has a longstanding talent for spreading out quotidian conversations over the course of a film until they take on a sort of novelistic sweep. 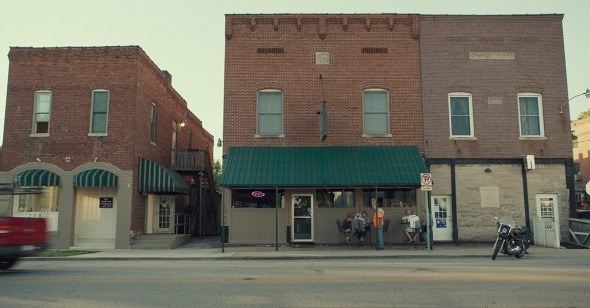 In Monrovia, Indiana, the committee’s conversations repeatedly turn towards a new development called Homestead, which becomes central to the movie even as it remains offscreen. The sort of high-density community recommended by the county man, Homestead is a flashpoint for arguments about the town’s growth, and is evidently still controversial years after its construction. Should the committee grant them a permit to build a second entrance even if this will likely mean more construction, an outcome to which multiple members are openly hostile? Wiseman carefully parcels out information about both the issue at hand and the people who debate it, such that it resists our usual red-blue schema for reading political conversations. Is the opposition to the new development rooted in a NIMBYish exclusivity or a deeper skepticism about the intentions of the developers? Late in the film, a resident of the complex comes to lodge a complaint: despite the presence of what appear to be fire hydrants, the town’s water supply system does not supply the community with the necessary infrastructure to deal with actual fires. In light of recent disasters at the National Museum of Brazil and London’s Grenfell Tower, his grievance is indicative of a certain peculiarity of this moment in the history of neoliberal capitalism, in which societies of untold wealth and technological advancement find themselves curiously unable to prevent very important things from being consumed by flame. The Homestead’s cosmetic hydrants, unseen, come off as a possible harbingers of doom. Of course there’s more to Monrovia than fraught council meetings. Wiseman is keen to make clear that this is a place in which people live out entire lives. One of the film’s funnier extended sequences depicts an extensive masonic ceremony honoring a society elder. Superficially absurd, as the lodge’s sleepy, often geriatric members (clad in a jarring combination of casual menswear and ritual costume) stumble through and sometimes mess up the procedure, there’s also a certain seriousness to the affair, an earnest attempt to congratulate a comrade on the achievement of some idea of the good life. This reaches its most direct expression in the film’s finale, in which Wiseman films the funeral of an old woman. Before multiple generations of her family, a fairly hammy preacher remarks on her life before making gestures toward the afterlife, building from warm anecdotes to what plays rather like a sales pitch for heaven. It’s a very characteristically Wiseman scene, serving up meaning to the exact degree that one is willing to read into it. It’s easy to be put off by the pastor’s showman presence, an odd blend of schmaltzy sincerity and performative opacity, but one should also allow the possibility that the demonstrations of spiritual longing that recur throughout the film are genuine. Before the departed woman is laid to rest beneath the wide Midwestern sky, we’re invited to consider all we’ve seen as little more than tribulations in advance of a glorious afterlife. The pastor invokes John 14:2: “In my father’s house there are many mansions.” A well-planned community, one imagines, with an excellent water supply system.